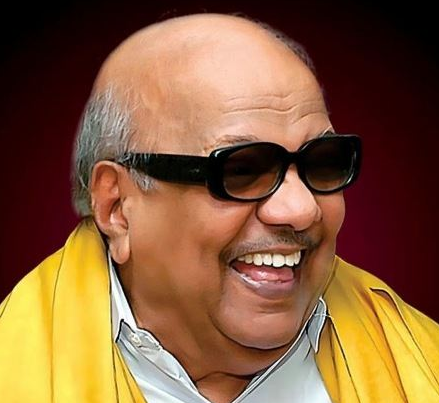 One of the popular Indian writer and politician is named as Muthuvel Karunanidhi served as Chief Ministry of Tamil Nadu for five terms and 20 years between 1969 and 2011. He is well known Indian celebrity. He is popularly named as Karunanidhi. He is famous for contribution to professional life. He is very talented and skilled politician. He was one of the long-standing leaders of the Dravidian movement and ten-time president of the Dravida Munnetra Kazhagam political party. At the age of 94, he left this world on 7th August 2018. He died in Kauvery Hospital of Chennai. The main cause of his death is Multiple Organ Dysfunction. By profession, he is a Politician. Before coming into the fame of politics, he worked in the Tamil film industry as a screenwriter. He has also written many novels, stories and so on. Passionate and enthusiastic politician, M. Karunanidhi was born on 3rd June 1924. He was born and raised in Thirukuvalai, Tanjore District of Madras. His real name is Muthuvel Karunanidhi. He is the son of Muthuvel Karunanidhi and Anjugam Karunanidhi, his father and mother. His nationality is Indian. His astrological sign is Gemini. At the small age, he began his career with politics. His religion is Atheism. Semi-Bald (White). He has a balanced body with good health. He has an attractive body figure. His smiling face and charming personality have helped him to gain the attention of all the viewers. He started his career as a screenwriter in Tamil film industry. Rajakumari was his first movie as a screenwriter which was directed by A.S.A Sami. His first notable movie was Parasakthi which was released in 1952 with huge box office hit. He went to work for Jupiter Pictures as a screenwriter at the age of just 20. Some of his historic movies are Ponnar Shankar, IIaignan, Pen Singam, Pasa Kiligal, Manamangal, Manthiri Kumari, Abhimanyu and many more. He also played vital role in the field of Tamil Literature. He wrote numerous poems, letters, novels, biographies, movie songs and many more. Some of his stage plays are in Naane Aravali, Ore Ratham, Palaniappan and many more. Some of his famous books are Sanga Tamizh, Romapuri Pandian, Nenhjukku Needhi and many more. Later, he was inspired by the speech of Alagiriswami of the Justice Party and entered into politics. He was just at the age of 20. Later, he founded a student organization called "Tamil Nadu Tamil Manavar Mandram" which was the first student wing of the Dravidian Movement and involved himself there. In 1957 election, he entered Tamil Nadu assembly by winning the Kulithalai seat and became the DMK Treasurer in the year 1961. In 1967 he also became the Minister for public works. In the year 1969, he became the Chief Minister of Tamil Nadu and the first leader of DMK after the death of Annadurai. In the year 1996, he became the CM of Tamil Nadu. Later, he penned the song "Semmozhiyaana Tamizh Mozhiyaam", the official theme song for the World Classical Tamil Conference 2010. Since 2016, he was in poor health and later in 2018, 28th July he was admitted at Kauvery Hospital in Chennai for treatment. He died at the hospital at 6:10 P.M on 7th August 2018 due to the failure of multiple organs. Karunanidhi is a married man. He married three times in his life time. His first wife name was Padmavathi. With her, he had a son named M. K. Muthu, who was briefly active in Tamil films and politics. Later, Padmavathi died. Then, he married Dayalu Ammal with whom he had three sons named M. K. Alagiri, M. K. Stalin and M. K. Tamilarasu, and a daughter, M. K. Selvi. Alagiri and Stalin are active in state politics. Tamilarasu is a businessman and film-producer and campaigner. Selvi campaigned for Karunanidhi elections. Again he married Rajathi Ammal, his third wife. With her, he had a daughter named Kanimozhi, who is seen as his literary heir. This excellent politician makes good money from his work. 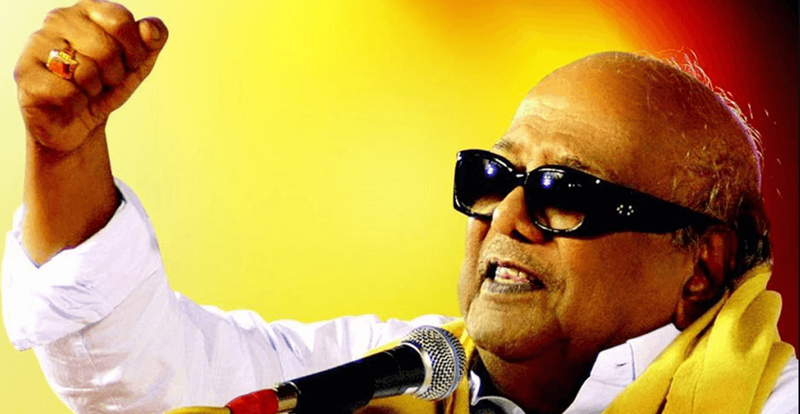 The net worth of Karunanidhi is estimated to have INR 11,94,37,427as of 2016. His salary is kept in privacy but there is no doubt in the mind of his supporters and followers he is satisfied with his earning.